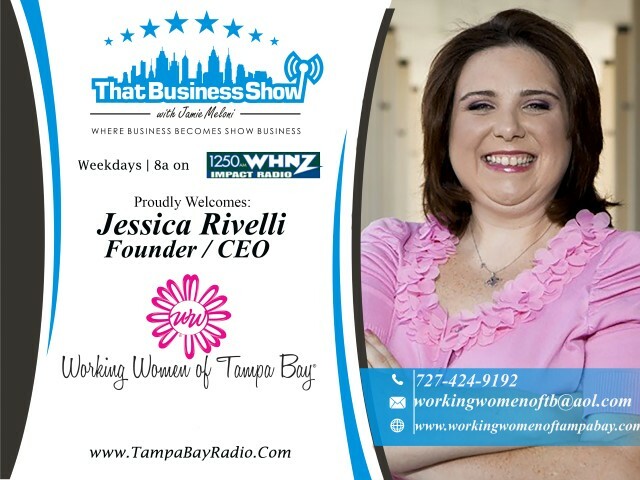 #WorkingWomenWednesdays – each Wednesday at 8am on #ThatBusinessShow on 1250WHNZ and learn more about the organization and all their amazing events at http://www.workingwomenoftampabay.com. Also, the annual Working Women Conference being held September 10th and 11th at the Straz Center in Tampa is an event you don’t want to miss. Check out the panel of speakers and get your tickets at http://www.workingwomenconference.com and use promo code Meloni2015 for a 10% discount off of tickets! After an update on the Conference and some upcoming events from CEO/Founder Jessica Rivelli, I spoke with Anu Vohra, Owner of Desi by Nature. This restaurant which is located at 1251 E Fowler Ave in Tampa features the finest in North Indian cuisine. Anu, inspired by her trip to India and desire to spend more time at home with her daughter, launched the restaurant along with her husband on May 22nd. Anu speaks about some of the many bullet points on Indian Food on this segment including the differences between North and South Indian foods. She elaborates that many of the Indian restaurants in Tampa feature Southern cuisine and she felt Tampa was lacking in North Indian inspired foods. Anu also dispels the myth that all Indian food is hot and spicy and invites all guests in to the restaurant where they can make you a number of wonderful dishes without all the spice and hotness that many people fear when they hear the term Indian food. Help support the restaurant by visiting them today, opening at 11am for lunch, be sure to mention that you heard about them on the radio. Learn more about them at http://www.facebook.com/dbntampa and you can reach them at 813-972-7400. 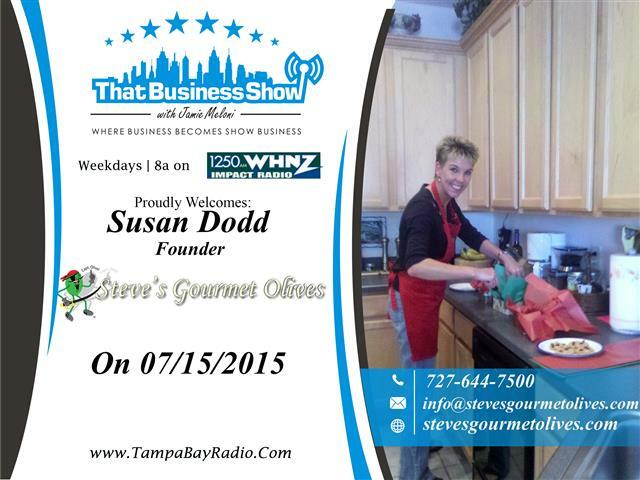 On the 2nd half of the show, Susan Dodd, Co-Founder and Owner of Steve’s Gourmet Olives joined me in studio. She brought with her their signature olives which are imported from Greece and Italy and marinated in a Red Zinfandel Wine from California and highlighted with fresh garlic, peppers, herbs and spices. Inspired by a trip to California’s wine country along with her husband’s love for marinating olives, she and her husband launched Steve’s Gourmet Olives 3 years ago and today are in a number of storefronts across Tampa Bay including ABC Fine Wine and Spirits and could soon be inside Winn Dixies, as she speaks of their upcoming pitch to them this Friday on the show. Susan also spoke of her mentor, Michele Northrup, aka the Saucy Queen whom you may remember from a prior show as being her guiding light in the business, helping her and her husband get the olives out of the kitchen and into mass production through the Sauceology Group. These olives and much more will be featured on July 22nd at the Radio Mixer at the iHeart Media Building too located at 4002 W Gandy Blvd in Tampa at 5pm to 7pm so come out and meet Susan, myself and many of the past guests from #ThatBusinessShow and learn more about Susan and the olive offerings at http://www.stevesgourmetolives.com and follow them on Twitter @mrscaptolive! This entry was posted in Entrepreneurship and Business and tagged bank owned, business, desi by nature, entrepreneur, gourmet olives, north indian food, olives, real estate, steves gourmet olives, working women of tampa bay. Bookmark the permalink.